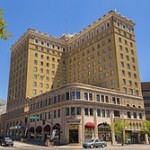 The historic hotel is said to be haunted and has a ghostly legend surrounding Rooms 1101 and 1102. So the story goes, a new bride on her honeymoon drowned in the bathtub in Room 1102. When her son came shortly after to collect her belongings, he stayed next door in Room 1101. He committed suicide there that night. Guests have reported that the bathtub water turns on by itself in Room 1102, and in both rooms folks have seen apparitions and heard voices. The hotel’s elevators are also said to work by themselves.